The IRS has for several years been targeting fiscally conservative and freedom-oriented grassroots organizations with highly detailed and burdensome demands. The effect has been to delay approval of tax exempt status, causing some organizations to abandon the effort, harming their ability to participate in the public debate. 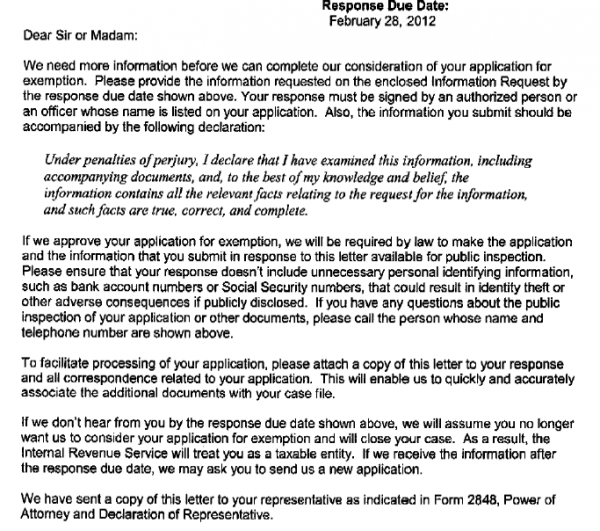 FreedomWorks has obtained the IRS letter listing questions to TheTeaparty.Net. The letter contains several pages of detailed and invasive questions, going far beyond any reasonable effort to determine whether the targeted groups are focused on public service and education rather than on candidate advocacy or electioneering. List all activities, rallies, advertising to be explained "in detail"
copies of current web pages. "If you are a membership organization, please include all the pages that are accessible only to your members"
Voter education and registration activities, in detail. One question may have required the organization to hire a professional grammarian to parse: "Who on the organization's behalf have conducted or will conduct the voter registration or get out to vote drives?" Any other tax-exempt organizations with which the group is "associated"
Excessive paperwork and complex protocol is a weapon used by power brokers in DC to make it impossible for individual Americans to exercise their basic civic duty to hold government accountable. Complexity is big government's strategy to avoid accountability. We have to bring more transparency to the system and expose the injustices and violations of civil liberties that we find along the way. Even the far left bellweather ACLU said the move showed that "giving the government too much power to limit political speech will inevitably result in selective enforcement," threatening civil liberties. Jenny Beth Martin of Tea Party Patriots said the requests made of conservative and tea party groups were "ridiculous". TheTeaparty.Net spokesman Dan Backer responded via email with the list of demands (pdf) that the IRS sent to the organization. We’ve just gone through our third round of IRS inquiries. The first round was probably not completely unreasonable since the original filing was made by volunteers and not lawyers. The 2nd round of questions was clearly politically driven, asked a great many questions designed to elicit information unrelated to exemption, and is discussed at length (and included in) the White Paper. The third round was pointless, burdensome, and serves no purpose but to harass the organization. The IRS' overreach in targeting these groups should bring Congressional investigation and media scrutiny. It shoudl unite the left, right, and center in defense of civil liberties. Instead, it may be used as a wedge to divide Americans even further. I was the co-founder of a non-profit community based art organization. We did all our own legwork in getting this done. We were also barraged with forms and requests, not much different than what you describe here. So, I guess my question is: What's your point? If you're going to claim tax exemption, then you'd better be working within the required parameters, don't you think? As I understand it, and correct me if I'm wrong, these political "non-profit" super pacs are restricted from pouring too high of a percentage of their "undisclosed" dollars into any form of political action. I personally believe that Citizens United has taken yet more representation and access from the hands of ordinary citizens with their victory in the Supreme Court, which was nothing more than this: Your access to equal representation and Free Speech is now directly proportionate to the amount of money and politicians you have in your pocket. It never ceases to amaze me how conservative fascists and liberal fascists quibble like children when they both get called on their BS. This debate removes the attention from the real problems. I swear, you're all like children trying to push the limits of the law, like children braving the cookie jar when Mom and Dad aren't watching, just to test the limits of what you can get away with. When we have public financing of all elections, (and if you call me a socialist, I will come down there and punch you in the mouth ;), maybe our elected employees could spend more time doing their jobs instead of wasting the 30-70% of their (our) time panhandling and influence pedaling to the carpet baggers of "K" Street. Now, about the Tea Party. An organization that started with a correct sentiment, but only about thirty years too late, but then the patron saint of corporate fascism, Ronald Reagan is one of their paragons of virtue, so why start there, when there are plenty of Democrats to attack for their misdeeds? Show me any difference between the two parties besides their superficial platforms and maybe I'll owe you a lunch! And one final thought. Privacy is one thing, but if you're going to pour millions to influence an election I want to know where that "undisclosed" donation is coming from. (Or what country?) In our Global climate where money can be transferred in a second from God knows where, did anyone even consider this when the case was examined? Or are the super pacs comfortable with taking money for OUR elections no matter what special interest, from which country, friend or foe, buys their way in? The point is that the IRS singled out *all* of the groups claiming tea party or similar political views for a raised level of scrutiny and hassle. Your fears about the Citizens United decision are misplaced. Tea party groups can't harm you. Government can harm you. As for the offer to be punched in the mouth, I don't know if you're a socialist or not, but your thuggery is not welcome here. "Instead, it may be used as a wedge to divide Americans even further." Oh- you mean like setting up "Grass roots" organizations that cater exclusively to the right, and constantly go against and obstruct and all ideas that the Democratic party might come up with? You are quite wrong in a number of your assumptions. There is no "Tea Party" and never has been, even though some people speak that way. What there are are hundreds of groups across the country, some small, some larger. I don't know of any of them that were created, engineered, or otherwise influenced to form by some larger group. Along the way, groups like FreedomWorks (and other national organizations) lent support to these groups. Some were sort of absorbed into the national organizations, or had their leaders picked off to head the state branch of these bigger organizations. As for Congress being effectively controlled by the GOP, I guess that depends on the definition of "control", but also that's even less relevant. FreedomWorks is not controlled by the GOP or vice versa, so as you say, that's a threadjack to this post. Correct me if I am wrong, but the "Tea Party" was essentially a "Grass Roots" organization purposefully engineered setup as another tool in the box for various conservative organizations, interests, and so on to influence Congress, which as we know is effectively controlled by the GOP. So again, please correct me if I am mistaken, but commentary placed on a Tea Party site would then I assume be directed towards not only the constituency, but to the GOP. Now- I will also go on to say that perhaps my comment here is out of place and for that I apologize. I too am totally against any sort of miss-use of power on part of the IRS and in this particular case I would agree- all parties and persons should rightly be concerned. But my previous and perhaps unrelated comments not really directed towards this particular subject bears some general truth,,, doesn't it? I'm not interested in which political party likes what I say.